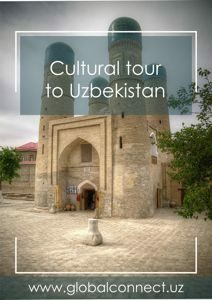 Classical Tour to Uzbekistan - Uzbekistan Tours! 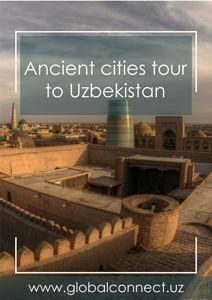 Classical Tour to Uzbekistan: Explore Ancient Cities Tashkent, Samarkand and Bukhara - the Oldest Inhabited Cities in Central Asia. Arrive in Tashkent. 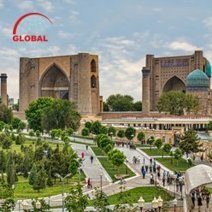 GLOBAL CONNECT driver will meet you at the Tashkent International Airport and transfer you to the hotel. 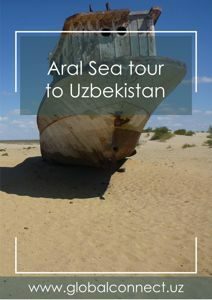 15:00 Start sightseeing from Old City part of Tashkent. 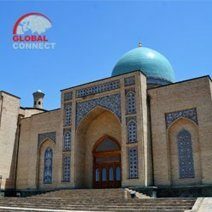 Visit Khast Imam - a cultic architectural complex and the religious center of Tashkent where the world famous Uthman Quran has been preserved. Khast Imam complex consists of Barak-Khan Madrasah, Tillya Sheikh Mosque, Muyi Muborak Madrasah, Kaffal Shashi Mausoleum, New Khazrati Imam Mosque and the Muftiate building. Drive to Chorsu Bazaar. 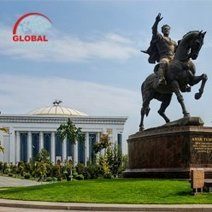 After exploring the bazaar visit the Monument of Courage, Amir Temur Square, Alisher Navoi State Academic Bolshoi Theatre, Memorial Complex of Memory of Repression Victims, and Independence Square. Dinner. Transfer to the hotel. Overnight at the hotel. 07:30 Breakfast at the hotel. 08:00 Transfer to the South train station. 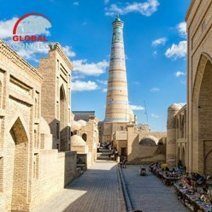 09:12 Transfer to Samarkand by Express fast train "Shark". 12:29 Arrive in Samarkand. GLOBAL CONNECT driver will meet you at the station and transfer you to the hotel. Check in. Free time. Overnight at the hotel. 09:00 Check out. 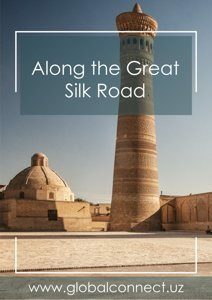 Leave your luggage in the hotel and start sightseeing in Samarkand. 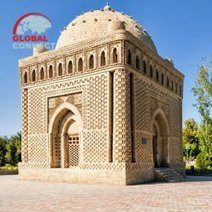 Visit Gur-Emir Mausoleum, Magnificent Registan Square, Bibi-Khanum Mosque and Siab Bazaar. Luxury Plov for lunch will be arranged by GLOBAL CONNECT. 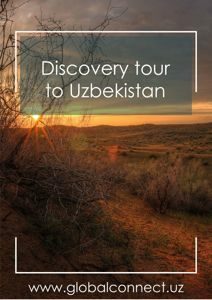 Visit Khazrat Khizr Mosque, Mausoleum of the first President of Uzbekistan Islam Karimov, Shakhi-Zinda Necropolis and Ulughbek Observatory, Mausoleum of Saint Daniel. Visit the "Meros" paper mill in Konigil village. Dinner. Pick up your luggage from the hotel and transfer to the train station. 21:03 Transfer to Bukhara by high-speed train "Afrosiyob". 22:34 Arrive in Bukhara. GLOBAL CONNECT driver will meet you at the station and transfer you to the hotel. Overnight at the hotel. 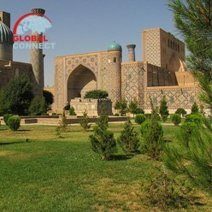 09:00 Start walking sightseeing tour in Bukhara. Visit Lyabi-Khauz Complex, Magoki-Attori Mosque, Chor-Minor Madrasah, Trade domes, Kalyan Minaret, Kalyan Mosque and Miri-Arab Madrasah. Lunch. 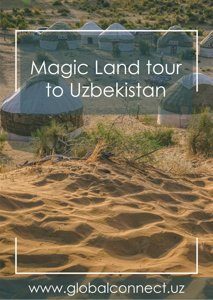 Visit Ulugbek and Abdulazizkhan madrasahs, Ark Fortress, Bolo-Khauz Mosque, Chashma-Ayub and Ismail Samani mausoleums. 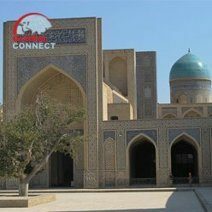 After exploring Bukhara city our driver will take you for countryside sightseeing. Visit summer residence of Bukhara’s last emir - Sitorai Mokhi-Khosa, Bakhouddin Naqshbandi Mausoleum and Chor-Bakr Necropolis. Free time. Dinner (Recommended to have a dinner at Nodir Devonbegi Madrasah Restaurant where you can enjoy Traditional Dance Show). Overnight at the hotel. 14:30 Transfer from the hotel to the train station. 15:51 Transfer to Tashkent by high-speed train "Afrosiyob". 19:40 Arrive in Tashkent. 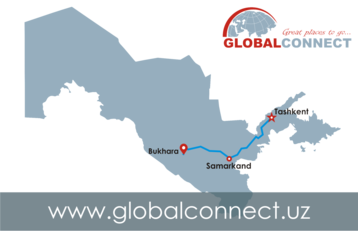 GLOBAL CONNECT driver will meet you at the station and transfer you to the hotel. Free time. Overnight at the hotel.